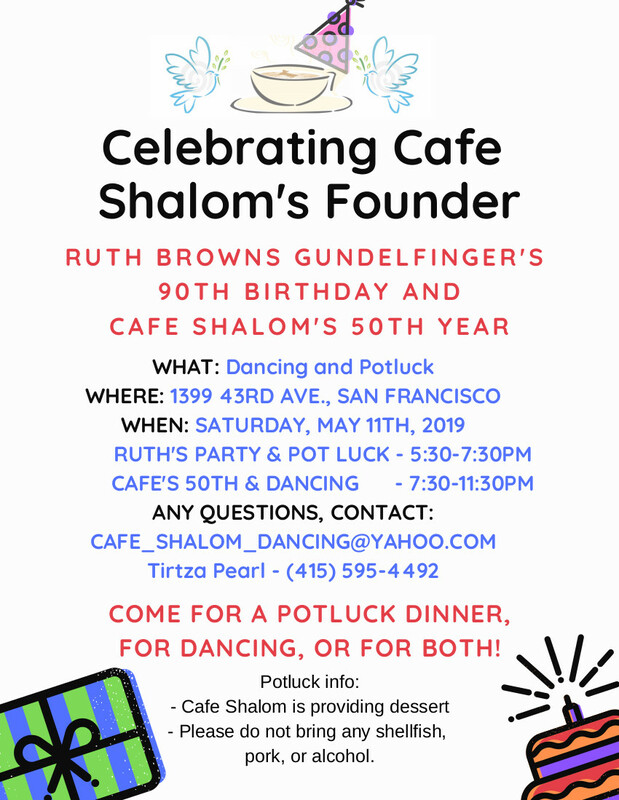 On Saturday, May 11, Café Shalom of San Francisco will celebrate the 90th birthday of their founder, RUTH BROWNS GUNDELFINGER, and the group’s 50th year, with a potluck dinner and dance party. This will be a chance to honor Ruth’s passion for Israeli dance and the joy she has brought to her teaching as well as to celebrate the Café Shalom community she envisioned 50 years ago. Dessert will be provided, so please bring other food to share for dinner along with serving utensils (no pork, shellfish or alcohol please). 1399 43rd Ave, at Judah St.